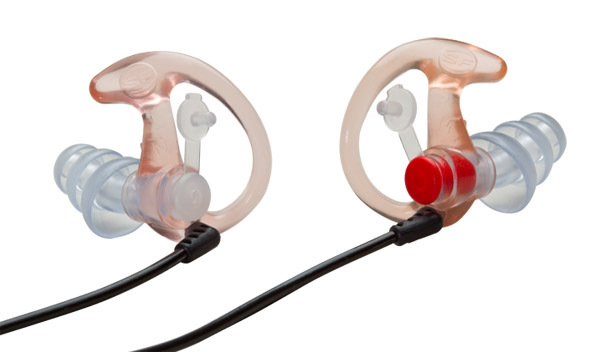 The Surefire EP4 Sonic Defenders Plus are filtered, flanged earplugs which substantially reduce loud noises while still allowing conversations to be heard. The patented Earlock retention rings comfortably lock earplugs in place, while the curved, triple-flanged stems conform to the natural shape of the ear canal for superior fit and comfort. Noise reduction rating (N.R.R.) 24dB with filter caps in. EP4's include attached filter caps, which can be inserted for additional protection and blocking out lower-level noise, like that heard on a plane, where hearing ambient sounds or conversations isn't critical. Made from a soft, but durable hypoallergenic polymer, the EP4 Sonic Defenders Plus provide all day comfort and protection. The triple-flanged EP4 is designed for those with larger ear canals. Medium Size. Comes with lanyard and carry case.